Palazzo Medici Riccardi, the seat o the metropolitan ceety. The Metropolitan Ceety o Florence (Italian: Città Metropolitana di Firenze) is a metropolitan ceety in the Tuscany region, Italy. Its caipital is the ceety o Florence. It replacit the Province o Florence. It wis first creatit bi the refuirm o local authorities (Law 142/1990) an then established bi the Law 56/2014. It haes been operative syne 1 Januar 2015. 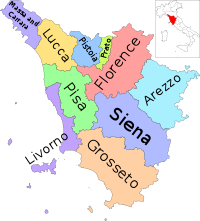 The Metropolitcan Ceety o Florence is bordered bi the Metropolitan Ceety o Bologna in the north, the province o Ravenna in the north-east, the province o Modena in the north-wast, an the provinces o Pisa an Lucca in the wast., the province o Siena in the sooth an the province o Arezzo in the east an sootheast. Hintle o its territory lees in the plain o the Arno river an haes sicweys acome an exurban sprawl aroond the ceety o Florence. The northeastren pairt o the metropolitcan ceety, in the Apennines, remains less developit. Romagna Granducale is the name gien tae the region leein on the northren slopes o Apennines. Corn, wine an silk are the chief products in the valley regions. Silk manufacturin wis a important industry in the medieval times. The well kent Renaissance airtist Leonardo Da Vinci wis born in Vinci which is a pairt o the Metropolitican Ceety o Florence. The caipital Florence is a well kent cultural an a lairge tourist centre. The Metropolitan Ceety receives lairge nummer o tourists ivery year. The caipital ceety Florence haes been recognised as UNESCO Warld Heritage Steid. Major tourist attractions o the ceety are Piazza del Duomo, Duomo o Santa Maria del Fiore, the Baptistery o San Giovanni, Giotto's Bell Touer, the Loggia del Bigallo an Museo dell'Opera di Santa Maria del Fiore, Ponte Vecchio an mony ithers. Sichts in Barberino di Mugello include Cattani Castle an Palazzo Pretorio. The Certosa del Galluzzo hooses airtwirks bi Pontormo. Giovanni Boccaccio's hametoun Certaldo is hame tae the Palazzo Pretorio an Boccaccio’s Hoose, while Vinci, birthplace o Leonardo da Vinci, hooses a museum dedicatit tae the Italian polymath. Sesto Fiorentino is kent for the Etruscan tomb “La Montagnola”. Wholesale an retail is the lairgest sector in the Metropolitan Ceety: As o 2008[update], amaist 29% o the firms in the umwhile Province o Florence wur involvit in it. Manufacturin, construction, real estate an agricultur are the next important anes wi a percentage share o aboot 19.5%, 14%, 13.6% an 8% respectively. Tourism is a important industry an aw. Empoli is kent for its auncient gless-makkin industry. The province is the centre o strae makkin industry. ↑ 1.0 1.1 1.2 Society for the diffusion of useful knowledge (1838). The penny cyclopædia [ed. by G. Long]. p. 319. ↑ Domenico 2002, p. 314. ↑ Domenico 2002, p. 318. ↑ Domenico 2002, p. 315. ↑ "Florence, Tuscany". ITALIA. Retrieved 18 September 2014. ↑ Cooke & Schwartz 2008, p. 185. ↑ Domenico 2002, p. 324. Domenico, Roy Palmer (2002). The Regions of Italy: A Reference Guide to History and Culture. Greenwood Publishing Group. ISBN 978-0-313-30733-1. Cooke, Philip; Schwartz, Dafna (2008). Creative Regions: Technology, Culture and Knowledge Entrepreneurship. Routledge. ISBN 978-1-134-07865-3. This page wis last eeditit on 11 Mairch 2018, at 18:23.